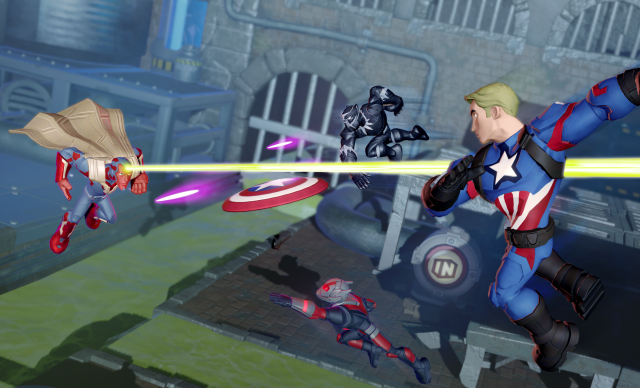 Before the heroes of the Marvel Universe clash in Captain America: Civil War later this year, fans will be able to assemble their own Marvel-themed fights in the latest Disney Infinity 3.0 play set, Marvel Battlegrounds. The new content for the game, which hits stores today, is bundled with an all-new figure, Captain America – The First Avenger, with four more heroes also available including Black Panther, Ant-Man, Vision, and black-suit Spider-Man. 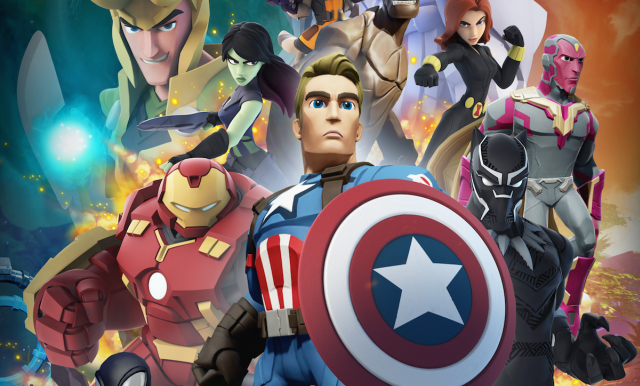 Coupled with the heroes from Disney Infinity 2.0, this brawler game mode will allow players 28 different characters to choose from in 4 player local co-op. Questions remain, however, not only of the logistics of this game mode, but how other traditional elements of Disney Infinity factor in. 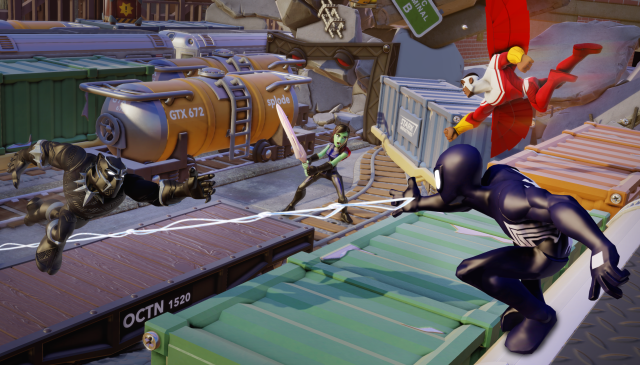 With that in mind, we spoke to Ryan Rothenberger, Senior Producer of Disney Infinity and Dan Sochan, Senior Producer at United Front Games (the Battlegrounds developers) about the title and their influences from another classic 3D fighting game. SuperHeroHype: So how does the four player co-op actually work since there’s only two positions for characters to go on? Ryan Rothenberger: That’s a great question. We looked at a bunch of different scenarios about how to make it work. Should we use two bases or what have you, but really we came down to a pretty simple solution which is when you’re playing in Versus Mode, you have a big character selection screen and all the characters stand right out. When you put a character down on the base, they get loaded into memory and then you can take them off the base and use your cursor to select them like you would a normal character selection screen. It was a pretty simple solution and the characters stay loaded in for that entire game session. When you turn the machine off they get wiped. SHH: Since this is the play set that has the most characters that are available and a lot of the Marvel characters are very unique in their own way, with that many characters how do you make sure they all have a unique play style and a move set that is unique to that character? Dan Sochan: That was definitely a challenge. Like you said, with 28 players with such a variety of powers from flying to super strength or super jump, trying to balance all those was a critical focus for us right from the beginning. So we took the characters’ move sets from what they had in the Toy Box, for 2.0 and the early 3.0 characters and boiled them down to their most basic moves and rebuilt sort of from there, making sure that everyone was balanced. So it was a lot of tuning, a lot of play testing internally and externally and getting feedback and constantly adjusting values to make sure that each character had a way of defeating someone else. And having that balance while still trying to stay true to what that character’s essence and what fans of Marvel know about each of those characters. SHH: Building off of that, how do you make sure that a character is stuck on the ground like Hawkeye is able to fight a character like Thor that can fly away? Sochan: That’s something we wrestled with for quite a while. In the end what we decided to do was add a flight meter so flying characters have a maximum ten seconds they can fly. We did actually find that for advanced users this was never really a problem, you will automatically target the guy above you and in the air, but we did find for more novice users they did struggle. They were more focused on going for players on the ground and not able to target players up above, so that’s what we ended up doing, but as sort of a strategy the best thing to do is move away from everyone else even if there is a player flying away for ten seconds. Moving away from the clumps in the middle and you’ll start targeting that guy above. You can also pick up objects and if you jump and throw them you’ll target those guys who are in the air. SHH: I’m curious, I suppose it works in the favor of everyone when you’re playing the story mode, but when it’s the Versus mode and you drop a power disc onto the base, what happens when you do that? Rothenberger: The Power Discs from Infinity 2.0 and 3.0 all work. What we did for Versus mode, and really throughout the playset, was we reimagined how the discs work. When you’re playing Versus Mode you don’t have a character down on the base since you’ve already loaded it in, so we had to rethink about how they were going to be activated. So rather than having one disc and one character over top of it on the base, what we did was allow you to stack up to six discs, three on either slot. What happens is the discs drop as power ups or pick ups, so after about 45 seconds of a fight going on you’ll see “Power Disc Incoming!” and a disc drops down and all the people can turn and try to collect it. Then once someone collects it if they get hit with a three hit combo or a big exploding barrel it will dislodge and someone else can then go and pick it up. And once it’s charged you can fire it off and activate it and it will hit everyone else in the arena. SHH: What about the costume change power discs, how does that work? Do they do something in game or is that something you’d put on the base with a character? Rothenberger: We kind of handle it in two ways. The actual costumes themselves, like Gamora’s space armor or Grey Hulk, we have in the story mode we have challenges. There are 28 individual challenges and each of them if you beat with a specific character will unlock something and in those challenges is where we unlock the character’s alternate outfits. So you don’t even need the disc at all for them, you’ll just unlock them in challenges and when you go over to versus if you highlight “Gamora” she’ll have an icon above her head to change her outfit and you can just toggle in-between. We keep that pretty self contained to the playset but if you do have the costume change disc itself we just treat them as boosts. So you put them down on the base, it will spawn in as a pick-up like the Infinity Gauntlet or anything else would. Now they just give you different boosts. Like Gamora’s outfit power-up is a speed boost and a shield boost, so you have enhanced powers for 15 to 20 seconds. SHH: With the challenges that unlock the alternate costumes, does that account for all of the characters or do some of the characters that don’t have an alternate costume power disc do they unlock something else besides an alternate costume? Rothenberger: Yeah, it does. So each of the challenges unlocks something. Some unlock the alternate outfits, otherwise they unlock three additional arenas and then also that’s where you get all your Toy Box toys. So if you beat challenge 12 or whatever you’ll get an exploding barrel you can use in the Toy Box or a train car. SHH: Are there any advantages for players in choosing which character they play as for the specific arenas? Is it advantageous to play as Black Panther in Wakanda or the Guardians of the Galaxy in Knowhere? Rothenberger: It is but not to say that Panther is better at Wakanda. Every arena has these traps in them that are activated by pressing a big Infinity button. For instance in the SHIELD Lunar base, there is a big jet engine, you press the button and a huge column of fire shoots out of the jet engine. So if you’re playing as Spider-Man for instance, I can hide in the back, turn on the button, and use my web sling to actually grab someone and yank them towards me and pull them into the fire. So stuff like that is where certain characters are more advantageous in certain levels. It’s usually how they’re interacting with the traps themselves or something like that. SHH: I’ve seen a lot of people online drawing the comparison from Marvel Battlegrounds to one of my favorite games, Power Stone 2. Was that something you guys strived for or was that a happy accident? Sochan: That was something that we strive for. It was definitely an inspiration. It was a game that a lot of us had played quite a bit back in the day on the Dreamcast, and what we really liked about it was the fact that it’s 3D. So not that it’s 2D or even 2.5D like some of the other fighting games, which ends up really giving a lot more variety to each of the characters because they’re not trapped in a 2D space. It allows them to showcase their skills and abilities. Flying becomes a lot more important potentially or character’s speed. Exploration of the arenas as well so it’s not just attack or defend, so you’ve got the choice of running around and chasing up power discs like Ryan mentioned, the green capsules which give you health, or the purple capsules that fill your special attack meter. All of those things added a lot of variety to how the strategy and how you’re actually going to battle each other and of course the environmental interactions were a huge part of Power Stone and we wanted it to feel the same in Battlegrounds. SHH: So if I’m playing the game by myself either in the Story mode or the Versus mode, am I able to have AIs play as other heroes with or against me? Or is it just me? Sochan: If you’re playing in the Story or Challenges, if it’s just you then the other players are automatically AI. If you’re playing in Versus you can choose to have it be three AI, you could disable slots so it’s 1 vs 1 or 1 vs 2, so there’s selectability there. But within the Story itself and the Challenge mode we did craft it to be single player or if you bring in a player for co-op then we adjust difficult accordingly. Rothenberger: There are some missions in story mode where if you’re playing by yourself you have an AI helping you on your team for that specific fight. SHH: Do you get to pick who that AI character would be or does the game automatically select that character? Rothenberger: The game autocratically does it. SHH: Are there any plans for allowing online play for this or is it going to stay as local co-op? Rothenberger: We talked about it a lot at the very beginning in all honesty. We don’t see it going online right now. We feel like the real magic of this game is playing on a couch with your buddies. If you get one guy like Dan that likes to sit in the corner as Rocket Raccoon and just chip away at everyone. Then you guys can team up on him. There’s a certain type of magic to that type of couch gameplay so right now we don’t foresee it going online. 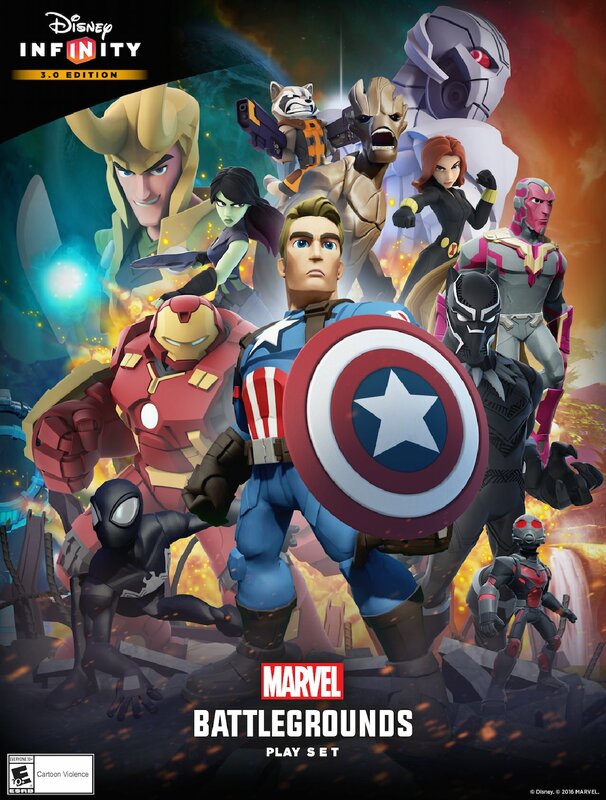 Disney Infinity 3.0 and Marvel Battlegrounds are available now in stores around the world.